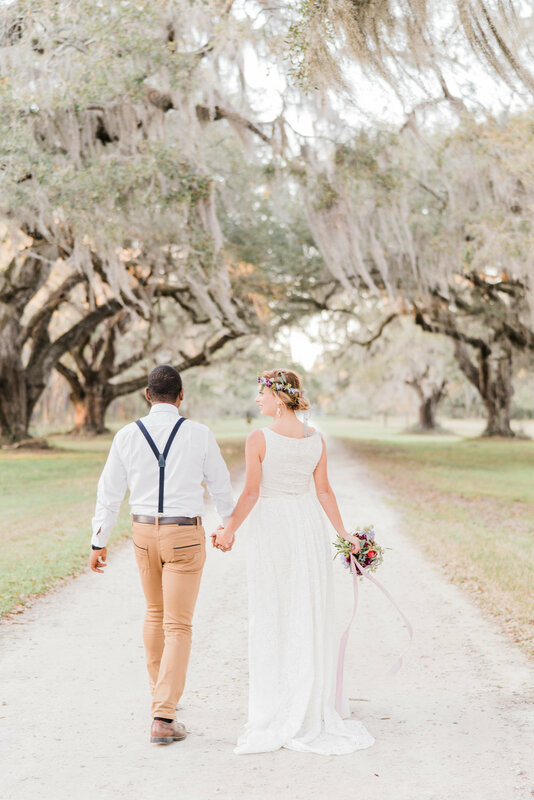 Imagine eloping with your true love on the grounds of a historic plantation with only the whisper of the breeze through the oak trees surrounding you as you exchange your vows. 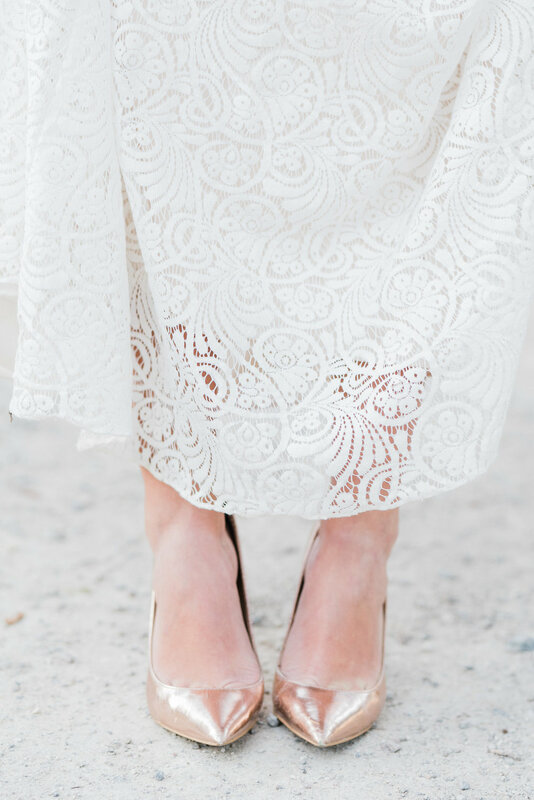 Add a flower crown, a jaunty bowtie, and you've got the boho elopement of your South Carolina wedding dreams! 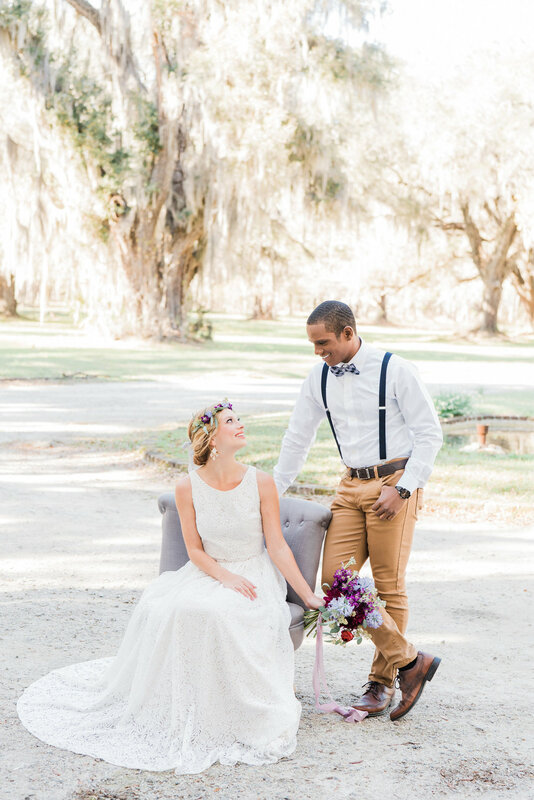 Led by coordinators Grace Paul Photography and Paper Swallow Events, photographer Kate Dye and a team of talented vendors spent an afternoon on this ACE Basin property, which is one of the few remaining antebellum homes in that part of coastal South Carolina (full vendor list below). 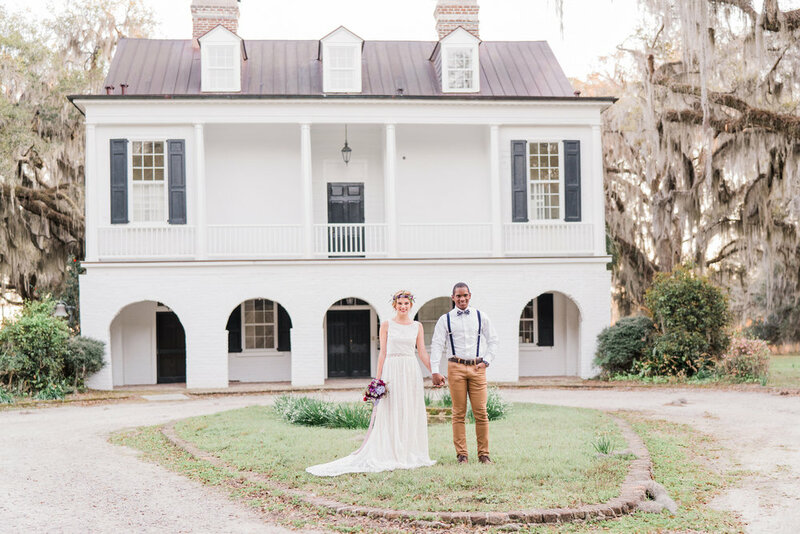 The resulting shoot from Grove Plantation House is nothing short of incredible. 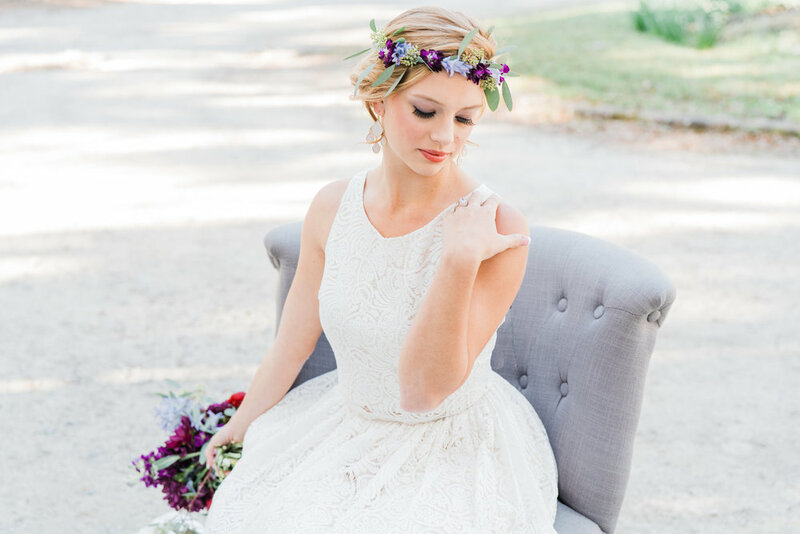 "We had a fabulous coordinator and stylist for the shoot who envisioned a Bohemian style elopement in a classic Lowcountry backdrop with whimsical touches like the sweet flower crown worn by the bride. Having never shot an elopement before, I approached it with the goal to show the beauty in the love between two people without having to use anything else to tell their story. Sure, wedding details like a cake and invitations and tons of florals help make a wedding gorgeous, but at the end of the day the most important thing is the love between the two people as they pledge their lives to each other. I think these images just show how beautiful your wedding day can be even when you strip it down to just the two of you." 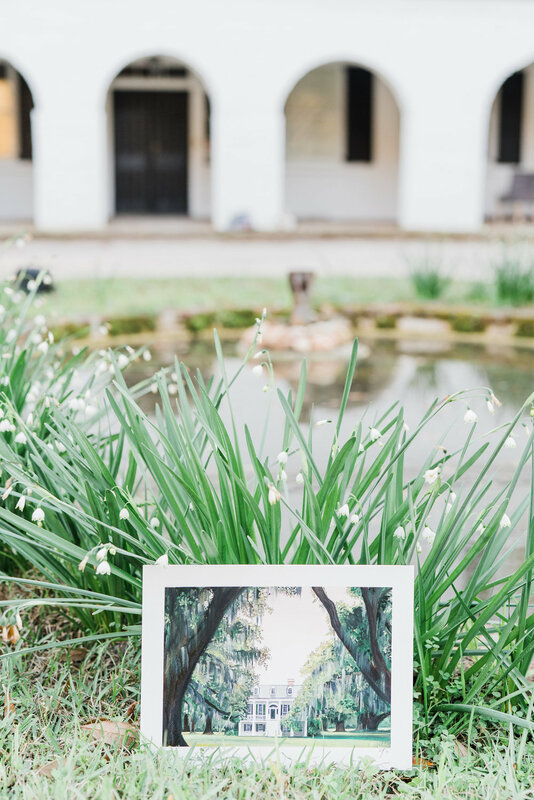 "There are so many gorgeous venues in the Charleston area that it's hard to find a new one, but this place really is a hidden gem. When you step onto the property, it truly looks like it's out of a movie with big white arches on the house and the Spanish moss sweeping down from the trees. It even inspired me to go home and watch "The Notebook" that night." "I am usually such a sucker for a classic tux, that it really surprised me how much I loved the more casual look the groom, Sterling, was rocking. But these images are proof that there is no wrong or right for your wedding day. The most important thing is to stay true to who you are as a couple. These two just ooze a laid back, easy breezy vibe, and I just fell in love with it." 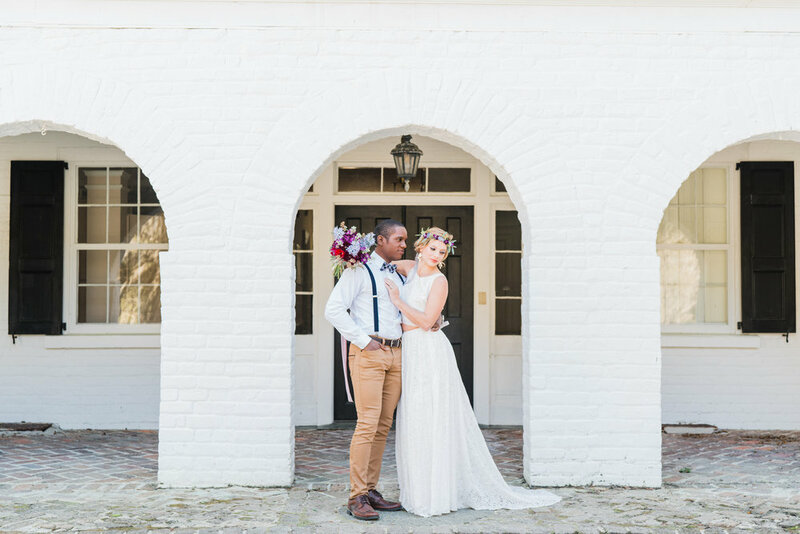 "Honestly, the only challenge of this shoot was that the property surrounding the Plantation house was so overwhelmingly beautiful that I wanted to shoot everywhere. With limited time we chose to go to the areas of the property where the light was the best, but I honestly could have spent hours with these two if time allowed."